Pantothenic Acid is a water-soluble B vitamin typically found in meat, eggs, legumes, mushrooms, broccoli and royal jelly. 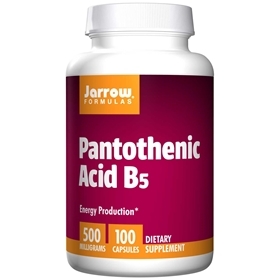 In the body, pantothenic acid is concentrated in the liver, adrenal gland, kidney, brain, and heart. Pantothenic acid is utilized by cells to synthesize Coenzyme A (CoA), which is essential for the production of energy via the Krebs Cycle. Pantothenic acid is also involved in intracellular protein metabolism and supports the wound healing process. Alcohol reduces pantothenic acid in tissues and impairs its metabolism. Other Ingredients: Rice powder and magnesium stearate. Capsule consists of gelatin.